Korean ginseng (Panax ginseng) is in the family Araliaceae, and it's an herbal supplement that comes from the root of the plant. It is known as the only true source of ginseng. Other names synonymous with Korean ginseng include Panax ginseng, mountain ginseng, wild ginseng, true ginseng, and Asian ginseng. Korean ginseng is available in two different forms including standard Korean ginseng (which is white) and Red Korean Ginseng (RKG). Each of the two forms of Korean ginseng (white and red) varies in composition as well as in the health benefits offered. It’s important not to confuse Korean ginseng with other types of ginseng, including Chinese ginseng, Siberian and American ginseng, or Pseudoginseng, each of which provides its own specific effects on the body. The root of the Korean ginseng plant is the part that is used for its medicinal properties; it has long been highly valued for its use in Traditional Chinese Medicine preparations. Of the thirteen total plants in the Panax genera, only five are used medicinally in Traditional Chinese Medicine, and Korean ginseng is the most widely used, according to the Korean Clinical Pharmacopoeia. Korean ginseng is a perennial plant (a plant that lives more than two years) that grows in the mountains in Eastern Asia. It grows well in the moist, shaded mountainsides of Korea, China, and Russia. The plant grows to a height of 2 feet or taller and has dark green leaves with red berry clusters. The root’s outer appearance is wrinkled and creased and the taste is considered slightly sweet with a bitter after taste. Korean ginseng has been used for thousands of years in Traditional Chinese Medicine to treat a wide range of ailments and promote health. 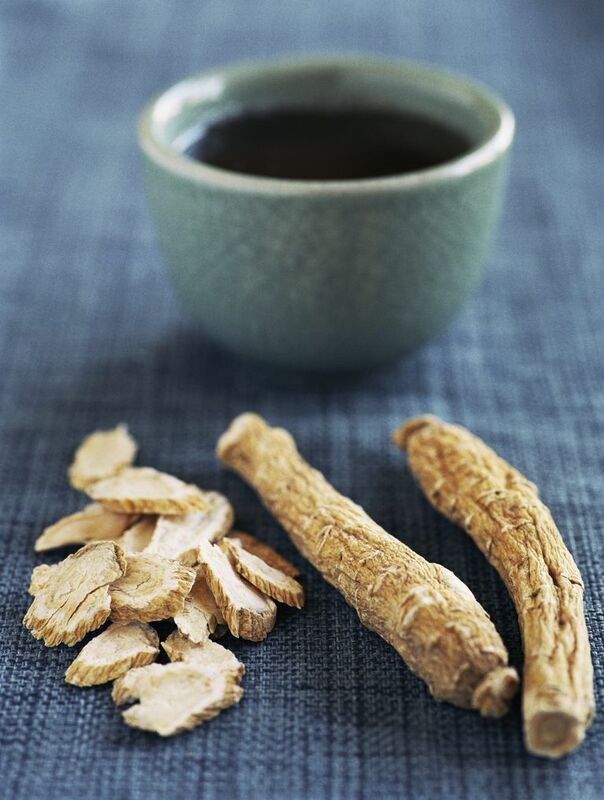 The primary use of ginseng in Traditional Chinese Medicine was for the treatment of weakness and fatigue. Panax ginseng can be treated with heat to make a form of ginseng called Red Ginseng. (The American Ginseng also has an altered red form). It’s important to note that Korean Red Ginseng (KRG) and American Red Ginseng are slightly different. KRG contains some unique bioactive properties that differ from regular Korean ginseng. To understand the difference between Korean ginseng and Korean Red Ginseng, consider how different forms of tea evolve from the same tea plant but vary because of the processing method. For example, the Camellia Sinensis plant can be made into green tea, white tea or black tea—depending on the processing method. Korean Red Ginseng is Panax ginseng that is heated with steam, then dried. The flavor of KRG is altered as well as some of the bioactive properties, such as its heightened anti-inflammatory properties. RKG can also be treated in a fermentation process which is thought to even further enhance its anti-inflammatory action. Korean ginseng is commonly referred to as an overall well-being medication. This is because it affects several systems in the body (such as the immune system, reproductive system, and neurological system). Although Korean Red Ginseng is not FDA approved for the treatment of erectile dysfunction, it is thought to improve the condition while increasing mental alertness. There have been studies that support its use in improving male erectile dysfunction, but more evidence is needed to further support these claims. There have been claims of the effective use of Korean ginseng for a wide range of medical conditions, but many of those claims are not substantiated by medical research. How Does Korean Ginseng Work? The plant of the ginseng root must grow for four to five years before it's ready to be used in a supplemental form. This usually translates to a high price for a quality form of ginseng. The primary active components of Korean ginseng are molecules called ginsenosides, which "have been shown to have a variety of beneficial effects, including anti-inflammatory, antioxidant, and anticancer effects. Results of clinical research studies demonstrate that Panax ginseng may improve psychological function, immune function, and conditions associated with diabetes,” says Dr. David Kiefer, M.D. A study of young, healthy volunteers found that single doses of Panax ginseng have shown cognitive improvements. The study also revealed that both the 200 mg and the 400 mg treatment led to a significant reduction in blood sugar. In a double-blind study (the gold standard of studies) of 384 post-menopausal women, Panax ginseng was not found to improve symptoms of menopause or influence the hypothalamic function (controls metabolic processes). Panax ginseng was, however, shown to be significant in reducing depression and increasing the overall well being in women during menopause. In a 2011 study of those who had suffered a heart attack (myocardial infarction) and were given 3 grams of Korean Red Ginseng each day, subjects were found to have an improvement in coronary flow reserve (an increase in blood flow in the coronary arteries). The study subjects were also found to have an increase in the number of immune cells after taking Red Korean Ginseng. One study found that social function, mood, and cognition benefits improved more than with placebo after four weeks of taking Panax ginseng of 200 mg per day. The same study discovered that after eight weeks, the benefits started to decline and became more like the placebo effects. Always follow the instructions of the prescribing healthcare provider about any type of food, drink (such as alcoholic beverages or caffeinated drinks), or activity restrictions as well as any drug contraindications (medications that should not be taken with other medications or supplements). Korean ginseng is usually made into a powdered form from the dry root and taken by mouth as a supplement. Although there is a tincture (a liquid preparation made with alcohol) and tea form available, most of the clinical research studies are performed using ginseng in the powdered/supplement form. When the ginseng root is dried—but not processed further—it is called white ginseng. When it’s further processed with heat and then dried, it’s referred to as red ginseng (because it changes color during the heating process). Ginseng should be stored at room temperature and kept dry, away from heat. Always take Korean ginseng (and any other herbal supplement) as directed by the healthcare provider. The average dose of Korean ginseng is about 200 to 400 mg per day as an overall health promotion/preventative herbal supplement. The 400 mg dose may provide the highest cognitive benefit from Korean ginseng. Other medical experts recommend 200 mg per day and suggest taking a two-week break from taking ginseng every two to three weeks. This is to avoid the possibility of getting a toxic reaction from the build-up of ginseng in the body. “Most published research studies have used a standardized Panax ginseng extract in a dosage of 200 mg per day,” says American Family Physicians. Do not take Korean ginseng at bedtime since the side effect of insomnia has been reported. Also, do not take Korean ginseng for long time spans (no more than three months). Be sure to discuss the specific safety precautions of taking Korean ginseng with your healthcare provider. When considering any herbal supplement, the dosage, potency, and purity of the product cannot be overlooked. To ensure a product that provides safety and quality, it’s important to pay attention to the ginsenoside ratio and quality of the ginseng supplement. The standardized Panax ginseng C.A. Meyer root extract G115, (trademark of Pharmaton SA) is used in many clinical research trials, according to Examine.com. The G115 patented extraction of Panax ginseng contains 4 percent ginsenosides (by weight). Another standardized extract, called NAGE contains 10 percent ginsenosides. Both extracts have been used in clinical research studies for quality standards. One study found that the purity of ginsenoside in these extracts (in the G115 and the NAGE) ranged from 95 percent to 100 percent. Can I use Korean ginseng if I’m pregnant? No, ginseng should not be used during pregnancy. Does Korean ginseng pass into breast milk—if so, is it safe for babies who are breastfed? It is not known whether ginseng passes into the breast milk, therefore nursing moms should not use ginseng. Is Korean ginseng safe for children? No, never give any herbal supplements to children without the approval of the healthcare provider. Do not take extra ginseng to make up for a missed dose. If it’s close to the time for the next dose, simply skip the missed dose. If a person overdoses on Korean ginseng or any other herbal supplement, it’s important to seek emergency medical care right away. Although it’s been touted that Korean ginseng is effective for the treatment of everything from the common cold to cancer, the clinical research evidence does not back up many of the claims about ginseng’s effectiveness. In fact, according to the research, Korean ginseng is most effective for mood disorders (such as depression), boosting the immune system, and improving cognition. Some evidence supports the use of ginseng for fatigue (in people with cancer, but not for healthy people). As with all other herbal supplements, it’s important to consult with the healthcare provider before taking Korean ginseng. Examine.com Staff. (2018). Panax Ginseng. Examine.com. Wiklund IK1, Mattsson LA, Lindgren R, Limoni C. (1999). Effects of a standardized ginseng extract on quality of life and physiological parameters in symptomatic postmenopausal women: a double-blind, placebo-controlled trial. Int J Clin Pharmacol Res. 19(3):89-99. Ahn, C,M., Hong, S.J., Choi, S.C., Park, J.H., Kim, J.S. (2011) Red ginseng extract improves coronary flow reserve and increases absolute numbers of various circulating angiogenic cells in patients with first ST-segment elevation acute myocardial infarction. Phytother Res. (2):239-49. Reaym J.L., Kennedy, D.O., Scholey, AB. (2005). Single doses of Panax ginseng (G115) reduce blood glucose levels and improve cognitive performance during sustained mental activity. Journal of Psychopharmacology (4):357-65. Drugs.com Staff. (2019). Ginseng. Drugs.com. Kiefer, D., M.D., Pantuso, B.S. (2003). American Family Physicians. Hong, B., Ji, Y., Hong, J., Nam, K., Ahn, T. (2002) A double-blind crossover study evaluating the efficacy of korean red ginseng in patients with erectile dysfunction: a preliminary report. Journal of Urology. 168(5):2070-3. Ellis, J., Reddy, P. (2002) Effects of Panax ginseng on quality of life. Ann Pharmacother. 36(3):375-9. Kim, H, Cho, J.H., Yoo, S.R., Lee, J.S...Son, C.G. (2013) Antifatigue effects of Panax ginseng C.A. Meyer: a randomized, double-blind, placebo-controlled trial. LoS One. 8(4):e61271.